Last Week in Review…Illustrator Edition! Last week we were pleased to have illustrator Lisa Brown visit SCDS. She has illustrated such books as The Latke Who Couldn’t Stop Screaming (a Glass Knife traditional read every year! ), Picture the Dead, Vampire Boy’s Good Night, and many more. She also may or may not be married to the elusive Lemony Snicket. Lisa spent the morning talking to Lower School students about drawing, and gave a great presentation to Middle School about where she gets ideas for her characters. She shared that she finds a lot of inspiration from everyday people (especially in airports and coffee shops! ), as well as old photographs. Then things got colorful when she had the Middle School audience help her come up with a story based on a couple of old photographs. What a treat! 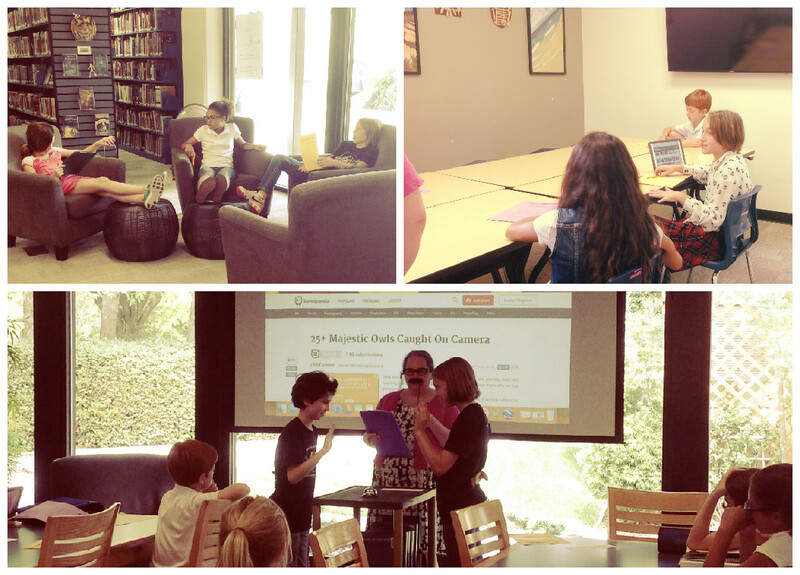 We also enjoyed having the 7th Grade science class in the library all week as they worked on their biomes projects. Look at them go! 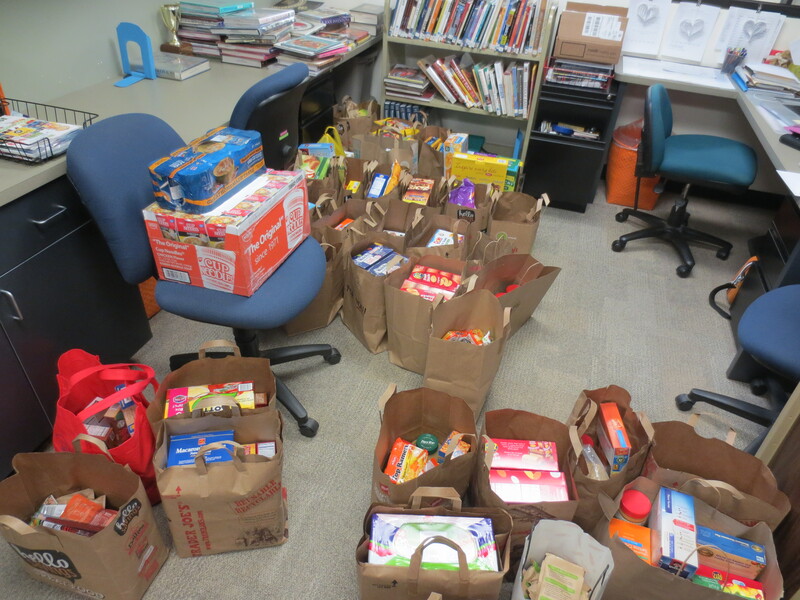 We were also pleased to send off our food donations to the Dyer Kelly food drive—High School students were encouraged to bring in bags of non-perishable grocery items for World Food Day. We had quite the collection taking over the library office! For our annual Teen Read Week raffle, Middle School students were able to enter up to 5 book titles they read during the months of September and October. We had an astonishing amount of entries from those folks! We also had some great entries from High School—their entries were selfies shelfies during Banned Books Week and Teen Read Week. Take a peek! And now, the moment you’ve all been waiting for…the raffle winners! Lunch for you + 3 friends provided by the librarian: Lia K.
Brownie on a random Tuesday: Anny S., Vanessa P., Sophie N., Saachi S.
Lunch for you + 3 friends provided by the librarian: Keerti R.
Brownie on a random Tuesday: Carter J., Jordan L., Arikta T., Nora S., Zola G., Catherine M., Kaci K., Lindsay B., Monet C., Sarina R., David S., Victor Z., Ethan M., Elizabeth B., Casey V., Emma B., John G.
Mystery prize: Anu K., Colin U., Rex Y., Charlie Rose T.
Wednesday we had brownies, hot apple cider (we want to believe it’s Fall weather outside! ), and Book Club! 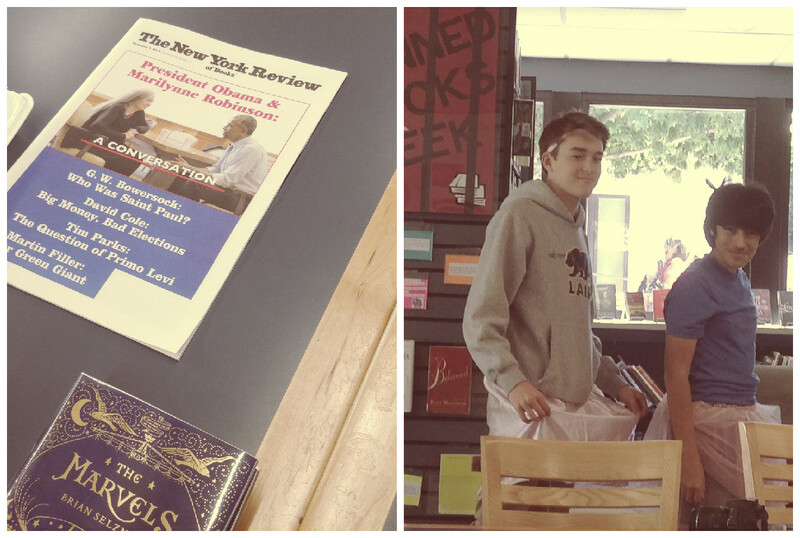 Our first order of business was the exciting news that we’ve started carrying the New York Review of Books in the library. Dr. Bell was very eager to share his devotion to the publication, as it always contains engaging content (and not just about books!). And in the spirit of…Spirit Week…Nico and Carlos wore their best pink tutus to support breast cancer awareness month. Way to be fancy, fellas! Ms. Melinson also talked about some of our new books; we’re thrilled with the new Brian Selznick book, The Marvels, as well as Rick Riordan’s new series, Magnus Chase and the Gods of Asgard. Anny said that she found it interesting that Riordan was focusing his new series on Norse mythology. Students had a lot of books to talk about; Amelia was looking forward to reading the Welcome to Night Vale novel (based on the podcast), Diego is enjoying a powerful novel called On the Farms of Love, and Luca is trying to finish The Martian before seeing the film adaptation. Dr. Bell said he’d been reading a lot of older mystery titles lately, particularly by Dorothy Sayers. He’s just finished reading Murder Must Advertise, and compared it to Mad Men. He offered a little bit of trivia: the phrase “it pays to advertise!” is attributed to Sayers. Ms. Nellis and Ms. Fels really liked reading The Earth Hums in B Flat for their book club, and described it as a very well-written and engaging story about a young girl in post WWII Wales. They said that Mrs. Batarseh listened to the audiobook, which they found particularly interesting because the narrator was able to pronounce the Welsh names appropriately, while reading the paper version of the book proved that task quite difficult. Dr. Portillo shared the book she’s been reading, called Radical Remission, which is a book based on research the author did about people that’ve been in cancer remission for 5+ years, and what they did differently that made them successful. For more information/a complete list of all the books discussed during Book Club, check out out Goodreads page here! 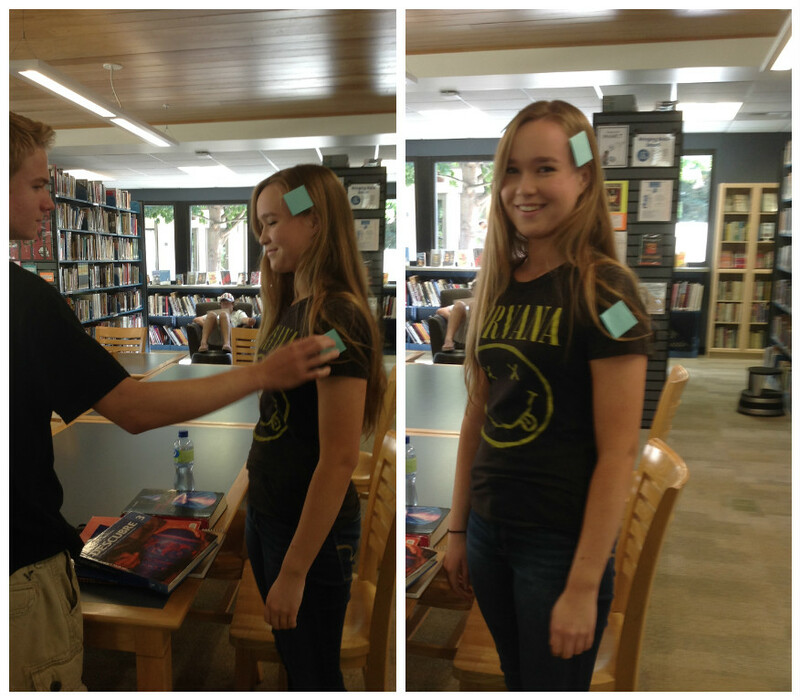 Last week we had some exciting times in the Matthews Library! On Tuesday we had a coloring, cookies, and chill session with high school students. We decided that it would be fun to offer up a space where folks could come and relax during lunch…and, yanno, sharpen up their coloring skills. 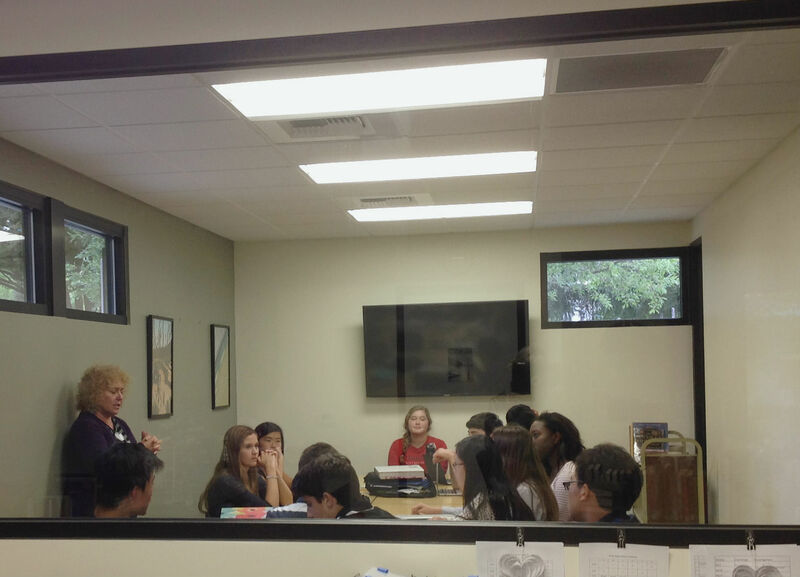 We also had the 7th Grade science class in the library to work on their biomes projects. Look how productive they are! And last Friday was World Food Day (a day of action against hunger). This year we were honored to have a guest speaker, Chef Matt Masera of the recently opened Empress Tavern and the critically acclaimed vegetarian restaurant on K Street, Mother. Chef Matt talked about his adventures in the cooking industry, how he got his start, and finished up with a really cool story about a baby alligator. Chef Matt has worked for Tyler Florence as a Corporate Pastry Chef as well as the Chef de Cuisine at Florence’s flagship restaurant, Wayfare Tavern. 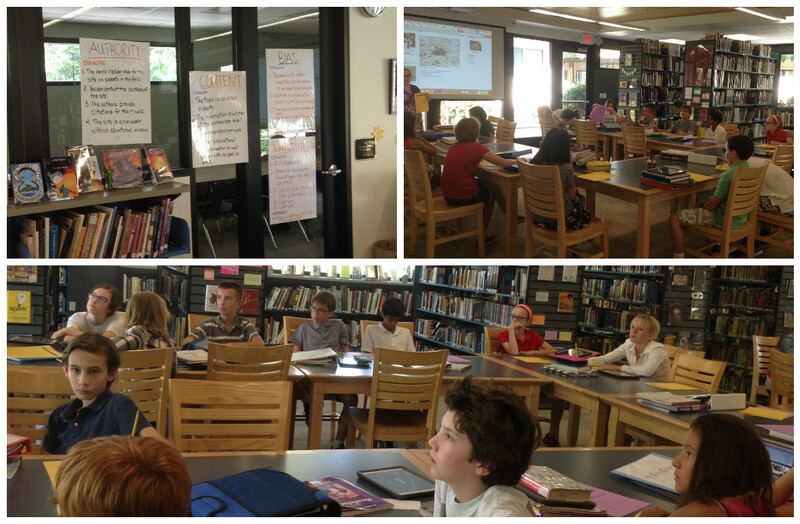 While the High Schoolers were on their class trips this week, we had the 6th Graders in the library every day for our orientation (whew!). Students learned all about the library programs and services, evaluated websites, and the best part: it ended in Family Feud, with Ms. Melinson playing the role of Steve Harvey. And on Friday, students began research on the background of the book Wonder. 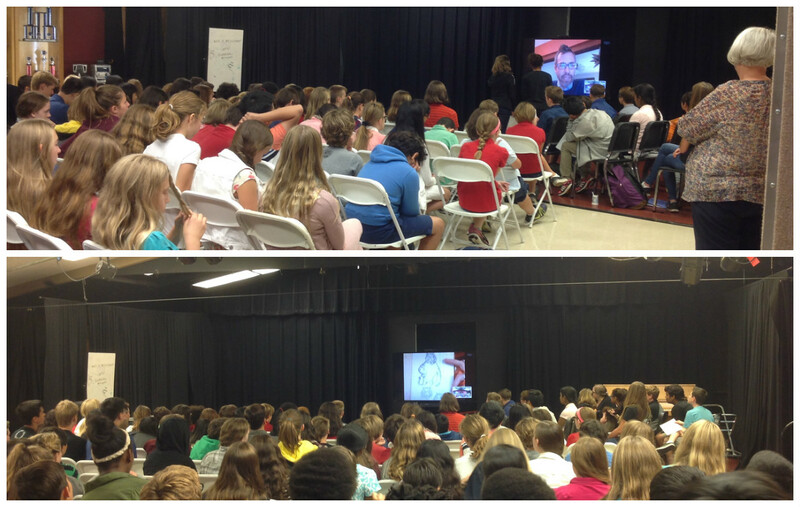 On Wednesday we had a very special Skype visit with the author of The True Meaning of Smek Day, Adam Rex. Middle Schoolers were able to chat with the author about his books, illustrations, and what it was like to see his book turned into a movie (Home). He also showed us some of the cool sketches he’s been working on. A few students were able to ask him questions they prepared beforehand. Fun! 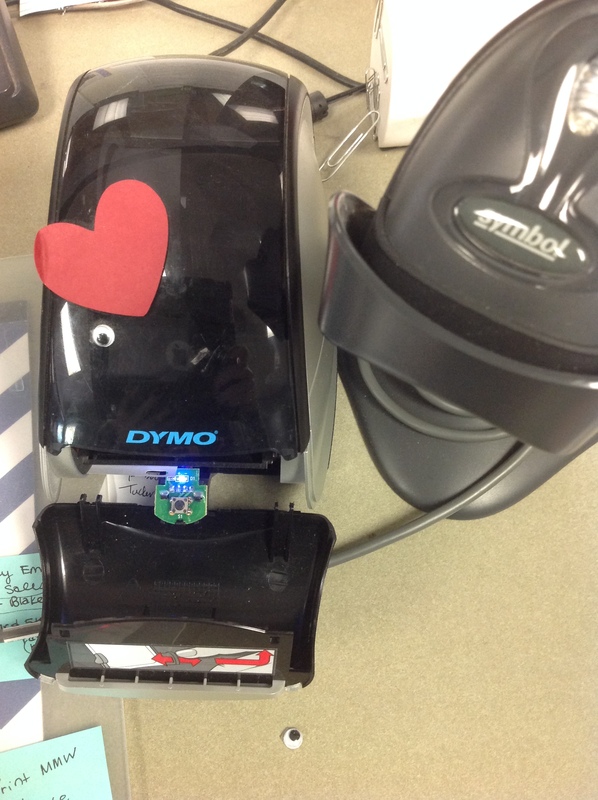 And on Friday, we had a little “incident” with Mr. Dymo, and he lost an eye. This is why you don’t play with letter openers, kids. Mr. Dymo is expected to make a full recovery, but is ready for the three-day weekend in celebration of Columbus Day. Well, well, well, SCDS’ers. It’s been another week for the books here at Matthews Library (pun intended). Actually, it’s been a week for banned books! This week we celebrated Banned Books Week and our right to read books of all kinds—even those “challenged” over time (and often for really silly reasons!). Mrs. Nellis brought in her History classes to do some research about Ancient Egypt to prepare for their Keynote presentations. 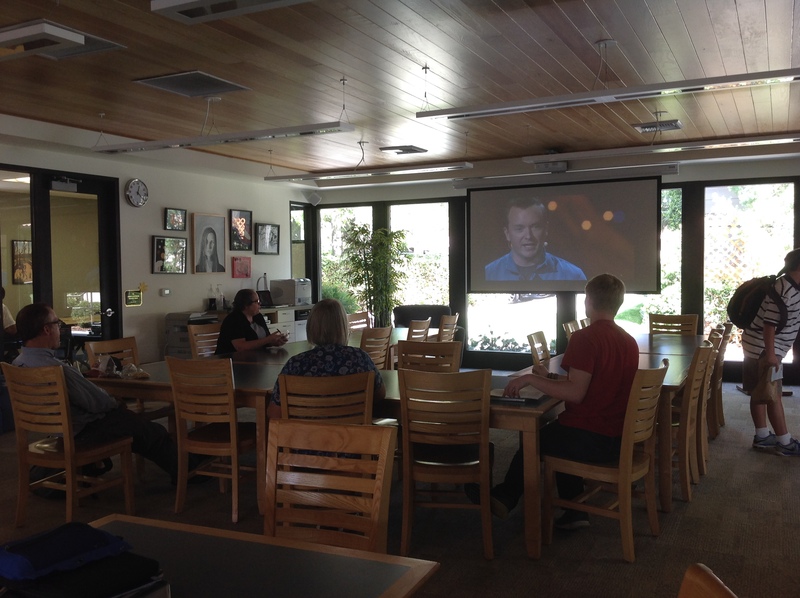 We had a great TED Talk on Tuesday featuring Phil Hansen, an artist who developed a tremor and “embraced the shake” to overcome his creative limitations. Kevin and Lea got a little creative with the Post-It notes…because sometimes studying just takes you there. We “jailed” a few students for engaging in the outrageous activity of enjoying some frequently-challenged books.They’ll each be entered into our Teen Read Week raffle (with fabulous prizes such as lunch prepared by the librarian, a brownie on a random Tuesday, and a mystery prize!). Look at these cute mugs (thanks for being good sports, Diego, Lia, Sophie, and Vanessa! ).